We all know that sinking sensation: You are on your way home from a vacation and you suddenly realize that you left your phone charger plugged in at the hotel. Or how about this ritual: You check into your hotel and look for some handy outlets to plug in your family’s four phones, your camera and your laptop; they get plugged in under the beds, behind the dresser and in the bathroom, respectively. This inevitably leads back to our first scenario. The cycle never ends. Well, this post may be short, but it may include the most important packing tip you have ever heard. Invest in an extra power strip to take on your vacations. Before you leave home, plug in all of the chargers and wrap it up. 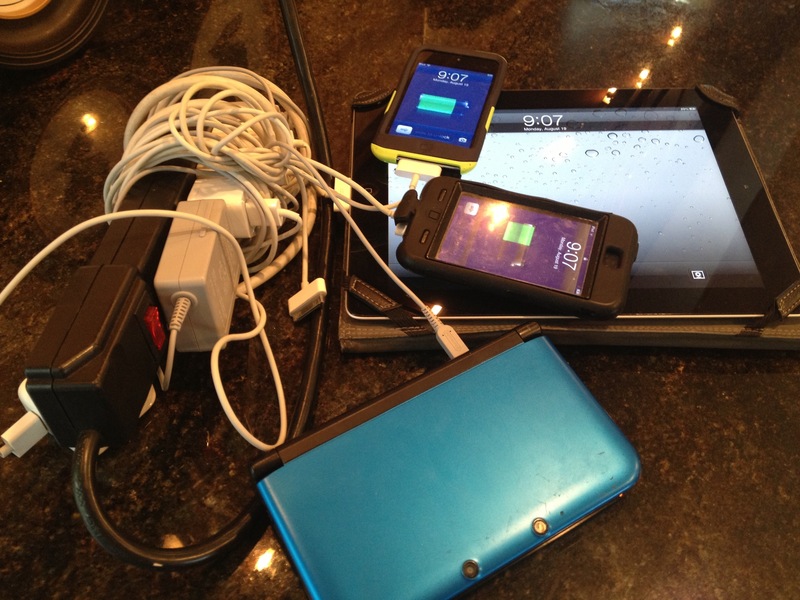 When you get to your hotel, you have your own personal charging station ready to go. Plug it in at the most convenient spot, and you’ll likely have a hard time forgetting it when it is time to pack up to go home. It isn’t pretty, but it gets the job done. This tip is so useful, we started bringing our strip with us whenever we go anywhere overnight, including our in-law’s house. Sometimes we even bring it with us when we are visiting grandparents just for a long afternoon. As a matter of fact, we even use our strip as our home charging station, which makes it even easier to pack up when it is time to travel. So, hit up your Five Below, pick up a new strip or two and never worry about crawling around behind your hotel’s dressers again.